Picking up on a report by the Palestinian news agency Ma’an, blogger Elder of Ziyon recently found out that a Palestinian official used a meeting with diplomats to spread what can only be called a blood libel. With this callous statement Abbas demonstrated the hollowness and duplicity of Palestinian politics on several issues. If this was truly his position, Abbas would obviously also have no right to decide that Palestinians in Syria should remain in a dangerous war zone without even being asked if they wanted to give up their imaginary “right of return” to Israeli towns and villages they had never seen in order to find some safety in Gaza or the West Bank. Palestinians like to pose as a state at the UN (and on Twitter), they have countless embassies around the world, and the Arab League considers Palestine a member state. Yet, there are Palestinian “refugee” camps in the West Bank and Gaza, populated by residents who consider themselves “refugees” even though they and their parents were born in the territories that 138 UN member states supposedly recognize as the “State of Palestine.” They are “refugees” because, once upon a time, their grandparents lived in a place that is a few kilometers away from the place they live now, and it doesn’t matter that both places are supposedly in “historic Palestine.” As Abbas demonstrated once again by declaring that “it’s better” if Palestinians “die in Syria” than if they seek safety in the “State of Palestine” and give up the fantasy of “returning” to Israel, the so-called Palestinian cause is about one thing, and one thing only: trying to achieve what the Arab armies failed to accomplish in 1948 when they attempted to destroy the fledging Jewish state. This is also the cause pushed so energetically by so-called “pro-Palestinian” activists – and they are as cynically open about it as Abbas: with their annual “Israel Apartheid Week” farce winding down, the Electronic Intifada published a post devoted to “Visualizing the discrimination faced by Palestinian refugees in Lebanon.” Yes, it turns out, there is real apartheid in Lebanon, and activists know it very well. “After more than six decades of forced displacement, Palestinian refugees in Lebanon find themselves largely excluded from the formal labor market. As a result of discriminatory laws and biased attitudes, most Palestinians face precarious working conditions and economic hardship. 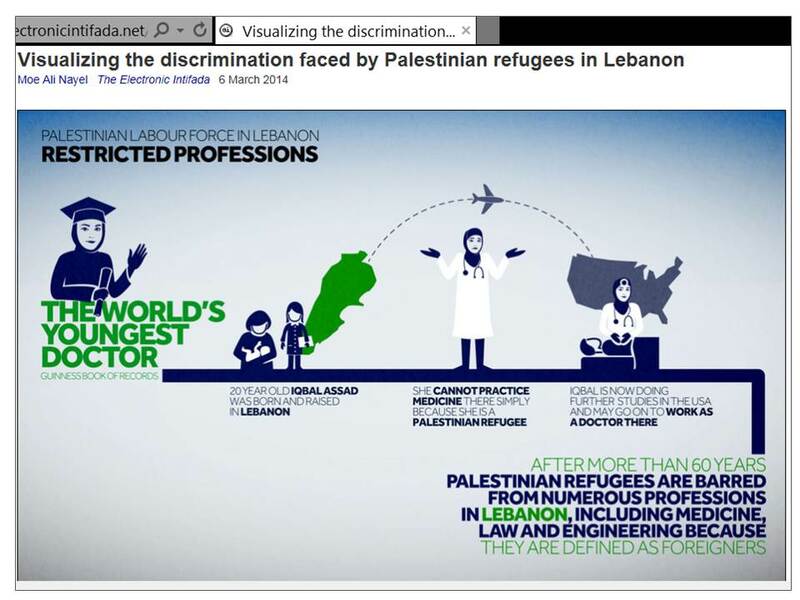 In Lebanon nowadays, when asked why they are paid less, many refugees can only reply ‘because I’m Palestinian.’ Why are you banned from practicing more than 70 professions? Why can’t you travel? Why can’t you own property? Why were you arrested at every security checkpoint? Why won’t Lebanese hospitals treat you? The most important question inside the Palestinian refugee camps is one which also has only one answer: what do you want? Whether it’s the Palestinian president or “Palestine Solidarity” activists in America, they don’t hide in any way what their “cause” is all about, and yet, hardly anyone notices that it’s not about the settlements. The world continues to pretend that it’s Israel’s responsibility that the Palestinians don’t have a state, while the Palestinians keep saying very clearly that they don’t want a state if that means accepting Israel’s right to exist as a Jewish state. Recent Israeli efforts to counter the widespread ignorance about the plight of the Jewish refugees who were forced to abandon their ancient communities all over the Middle East since the late 1940s have been widely denounced in the Arab media. But if anyone is proposing cynical definitions, it is Ashrawi. As David Harris rightly emphasized in a devastating response to Ashrawi’s article, the views she expresses are part of longstanding Arab and Palestinian efforts to rewrite and deny Jewish history, and ultimately, these efforts are a deplorable reflection of the unwillingness to accept Israel’s right to exist. Indeed, in the late 1940s, when some 800 000 Arabs fled the fighting initiated in their name to prevent or undo the establishment of Israel, there were many millions of refugees all over the world, particularly in Europe and in South Asia, where the partition of India created at least an estimated 12 million refugees. From all these many millions of refugees, only the Arabs from Palestine became eternal refugees who, up to this day, insist on a hereditary refugee status that has swelled the ranks of the original 800 000 to about 5 million, who are served by UNRWA, the UN agency created exclusively for Palestinian refugees. While UNRWA officials and supporters are apparently happy to endorse the preposterous Arab notion of “positive discrimination” – a convenient euphemism for the cynical denial of basic rights to Palestinian refugees in Arab countries – the political motivation for this very real policy of apartheid is clear: while official Palestinian documents describe the Palestinian people as “part of the Arab Nation,” the refugees were not integrated into their Arab host countries in order to keep their demand for an imaginary “right of return” to Israel alive; and whenever this “part of the Arab Nation” was offered the opportunity to establish for itself yet another Arab Muslim state, the price of peaceful co-existence with Israel was apparently too high. The sophistry of all the arguments that are used to justify continued Palestinian rejectionism and the cynical claim that Palestinian refugees must be considered a very special case with special rights is once again illustrated by Hanan Ashrawi’s current efforts to deny that the roughly 800 000 Jews who fled Arab and Muslim countries were refugees. What then about the hundreds of thousands of Palestinian Arabs who never even left the areas they considered as their homeland and just moved a few miles to Gaza, the West Bank or Jordan? If Ashrawi wants to argue that people who left their original homes for whatever reason and ended up living in their historic homeland cannot be considered refugees, then surely the Palestinian Arabs who moved just a short distance and remained within the boundaries of what was historically regarded as Palestine never qualified as refugees. So according to Hanan Ashrawi’s criteria, we have to conclude that there is no such thing as Palestinian refugees in Gaza, the West Bank and Jordan. Of course, the Palestinian Arabs who remained in the area of historic Palestine would indeed normally be regarded as internally displaced persons, and not as refugees. Needless to say, nothing could be further from Ashrawi’s intentions than to have Palestinian refugees defined and treated just like any other refugees. Indeed, she couldn’t care less about other refugees, as is amply illustrated by the fact that when her ridiculous criteria for Jewish refugee-status are applied to other refugees, most of the refugees from the late 1940s magically disappear. You see, the some 12 million German refugees after World War II and the probably even greater number of refugees created by the partition of India weren’t really refugees: after all, Ashrawi tells us that the reasons why these people left their homes aren’t that important, what is important is that the Germans who were expelled from formerly German areas or from long-established communities in other European countries mostly ended up living in their homeland; the same applies to the Muslims and Hindus who moved between India and the newly created Pakistan. According to Hanan Ashrawi, all these people just went home, and their plight paled in comparison to the Palestinians, who must be considered desperate refugees even when they remained within the boundaries of historic Palestine, and even when they live under Palestinian rule in Gaza and the West Bank. 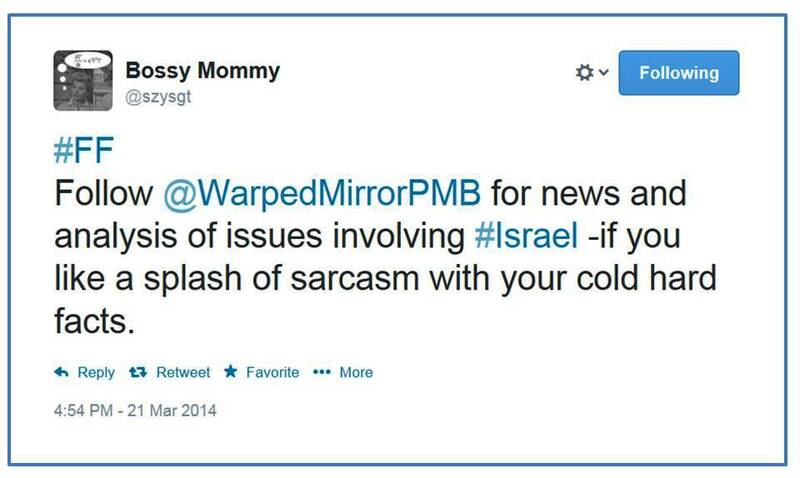 Truly: Palestinian propaganda at its best – or rather, at its cynical worst. Finally, a personal note. When I read Hanan Ahrawi’s recent output, I couldn’t help remembering the times when I and many of my friends used to nod along with whatever she said. That was of course back in the hopeful Peace Now 1990s, when many Israelis believed that Hanan Ashrawi represented the Palestinians who were just like us, and wanted nothing more than peaceful coexistence. For me personally, the rude awakening came in October 2000 when Ashrawi defended the gruesome lynching and mutilation of two Israeli soldiers in Ramallah, where Ashrawi lived. Her neighbors behaved like animals, but the internationally admired Palestinian spokeswoman couldn’t bring herself to condemn the barbarity and preferred instead to invent some sort of justification. That was the moment when I realized who Hanan Ashrawi was, and what she stood for.